South Korean authorities caught sight of the object and shot at it with machine guns, firing about 90 rounds in total. The object retreated back into North Korea, disappearing from radar screens. The initial speculation was that the objects were drones, sent to spy on or even attack South Korean positions. A media briefing later revealed the nature of the flying objects to be balloons. "Judging from the results of an analysis, [we] believe there is a low possibility that the objects were drones," said Moon Sang-gyun, a spokesman for the Ministry of National Defense. He also mentioned that 10 objects in total were detected. When reporters asked whether he believed the ROK military overreacted to the incident, Moon dismissed the criticism. "The military was reacting in consideration of the worst-case scenario," he said, adding that troops along the Military Demarcation Line (MDL) are instructed to fire on any unknown object crossing the border if it doesn't heed their loudspeaker warnings to turn back. "We prepared thoroughly according to procedure until the object was clearly identified." "I'm not sure what to make of this, honestly," Robert Kelly, a professor of political science at Pusan National University, told the LA Times. "The balloon… might just be some random act by a local commander trying to impress his superiors." North Korean media did not comment on the incident. The incident has been taken as another example of the high tensions and disintegrating detente between North and South Korea, which are still technically at war since the 1953 armistice. Last week, new South Korean President Moon Jae-in said there was a "high possibility" of a renewal of armed hostilities. 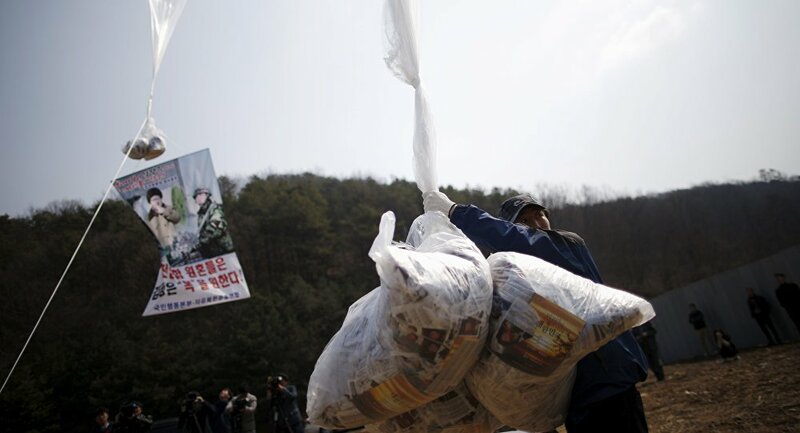 South Korean private citizens often fly balloons bearing anti-North propaganda and light material goods like food over the border, much to the frustration of both sides. Most recently, a North Korean defector sent leaflets containing information about the murder of Kim Jong-nam, believed to be the work of North Korean assassins, across the world's most heavily-guarded border.